Maybe T-Mobile should adopt Subway's $5 jingle. T-Mobile is offering new and existing customers an iPhone 6S (16 GB) for $5 a month with an old iPhone 6 or 6 Plus trade-in. 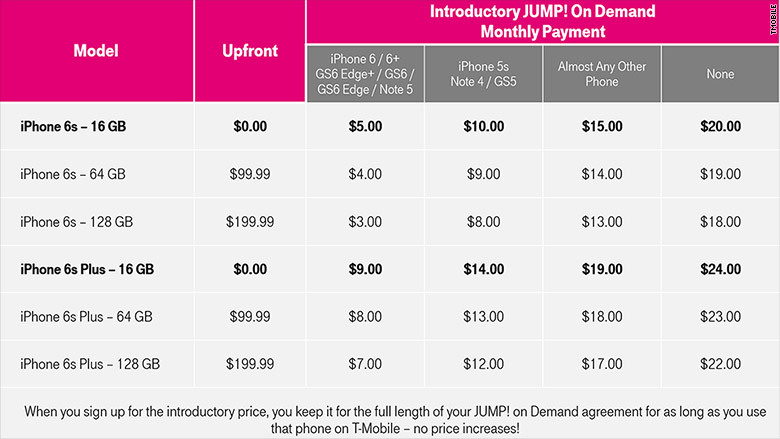 The promotion is part of T-Mobile's "Jump on Demand" contract that lets you upgrade to a new smartphone up to three times a year for free. With the plan, you aren't buying an iPhone -- you're agreeing to pay a certain amount each month for 18 months. At the end of the term, you can keep your phone for an additional $164 (which is $125 cheaper than the retail price of a new iPhone). 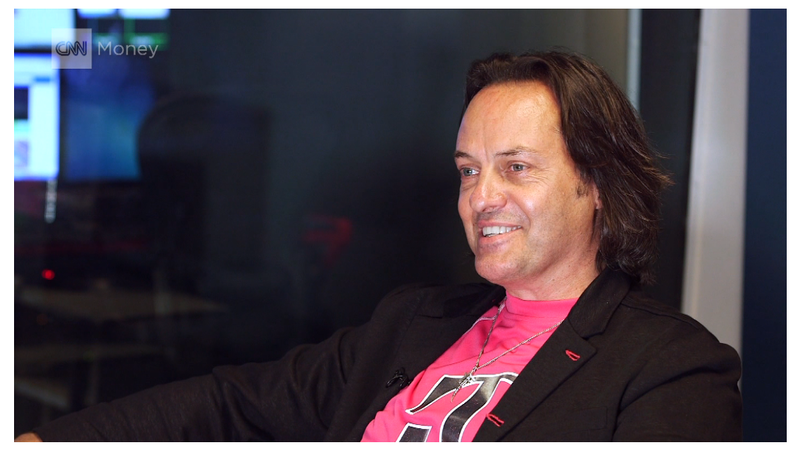 T-Mobile (TMUS) CEO John Legere announced the deal on Twitter Tuesday afternoon. "YES -- you read it right!" Legere tweeted. Apple's new iPhone 6S and iPhone 6S Plus officially go on sale Friday, but carriers are already scrambling to outdo one another with deals. This is the second big iPhone 6S promotion that T-Mobile has launched. Last week, the carrier announced a $20-a-month lease offer for the new iPhone 6S without a trade-in. -- Voluntary smartphone insurance from T-Mobile is an additional $8 per month, which covers damage repairs and a replacement device for lost or stolen phones. Customers can also choose to buy Apple Care. -- There is no pre-planned expiration date for the promotions, a T-Mobile spokesman told CNNMoney. If customers don't want to buy the phone at the end of 18 months, they can lease another phone at a new rate. -- An iPhone 6S (16 GB) will cost $5 per month with no down payment with an iPhone 6 or 6 Plus trade-in. With an iPhone 5S or Samsung Note 4 trade-in, the cost doubles to $10 per month. Most other phone trade-ins cost $15 per month. Without a trade-in, it costs $20 per month. -- An iPhone 6S Plus (16 GB) will cost $9 per month with no down payment with an iPhone 6 or 6 Plus trade-in. With an iPhone 5S or Samsung Note 4 trade-in, the cost is $14 per month. Most other phone trade-ins cost $19 per month. Without a trade-in, it costs $24 per month. -- For the 64 and 128 GB, there is a $100 and $200 down payment. The monthly cost structure is the same, just $1 cheaper.